I've always felt like an impostor at games -- not all of which I've attended. Pathetically, I've never understood the rules and terminology and find the zealousness and shouts of "Ice it!" or "Back to the point!!" amusing if not a foreign language altogether. I'm at the ice rink watching my little girl attempt to skate with her friends. Awkward and unwieldy, they go about three feet before grabbing the wall or falling. They're laughing and look like they're trying to clean the floor -- like those cartoon characters with soap brushes tied to their feet. On my daughter's feet are her teen brother's old hockey skates from when he was little and just as unsteady as she is today. But her brother is away right now at an ice hockey tournament four hours away -- his last one there since tournaments only go up to U16 in that town. As I watch the girls skate, I think about my son's evolution as hockey player and am deeply nostalgic and even sad that it's all flown by so fast. The reputation of the hockey parent is renowned -- I've never heard the term "basketball parent" or "football parent." Hockey parents are different kind of animal -- and not because they've become accustomed to that distinct, piercing odor that is unique to the sport. There's a kind of camaraderie amongst them. It's almost tribal. "I'm a hockey mom," one parent will say to another and they'll exchange a look of solidarity. 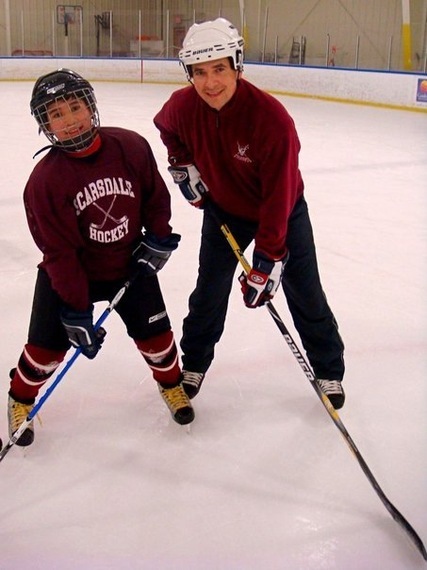 Hockey parents know each other's kids and their athletic skills like their own. They've had endless cups of early morning coffees together to rouse themselves awake for 5 a.m. practices and endless more to keep themselves up for training that sometimes goes until almost midnight. They've driven thousands of miles caravan-style to tournaments far and wide, stayed in the same familiar chain hotels and dined together at numerous, carb-heavy buffets for team dinners. Parents with kids in other sports often shake their heads in disbelief when they hear about the practices -- four sometimes five times a week. On ice, off-ice, early Sunday morning, weekend tournaments, holiday tournaments and late night training on school nights. There's a special bond that's formed between the hockey parent and child from all this time together and a dedication to the sport and team that I've always been in awe of. You see, I am not a hockey parent. I am the mother of an ice hockey player but I can't make the "hockey parent" claim, which I reserve, for those deserved parents who are knowledgeable of the ins and outs -- passionate about the sport. Not me. When our son first started playing as a little boy, I was livid when he broke his leg -- blaming my husband for exposing our child to such a rough sport. My husband is a hockey dad though. He played the sport as a child in Montreal and even got his coaching certification in the States and here in the UK so he could be on the bench with our son through every game. Like every hockey parent, he's knelt down to hold his young child's skates between his knees to do up his laces. He's taped hockey sticks until our son learned to tape his own. He's watched our son's skating skills go from soap-brush shuffling to speeding backwards adeptly across the rink. He's held compresses to our son's bruises or sat with him at the ER numerous times for sprained ankles or ears that needed stitching. He's advised on game strategy, encouraged hits, pep talked and cheered him on year after year. It was my husband that signed our son up for hockey camps across the Northeast and paid out crazy money every summer for new skates, equipment and hockey dues. But our son is coming to the end of his junior hockey "career." He'll play for another year, maybe two and then he'll go to college where he may play more. The difference is, it won't be with his dad. My husband is at peace with the fact that his one-on-one hockey time will soon draw to a close. There's a satisfaction in knowing he's instilled in our boy a deep sense of team commitment, responsibility and overcoming adversity. 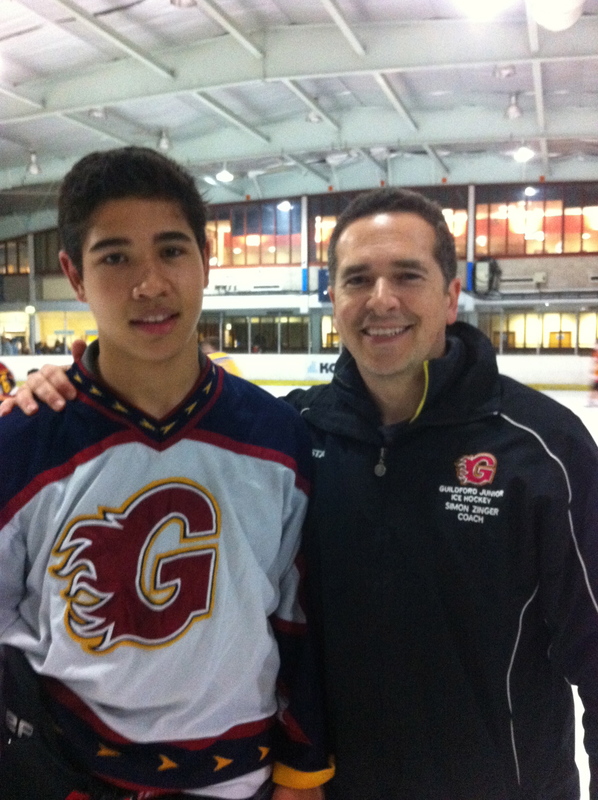 He's been personally invested from the start and can lay claim to playing a key role in our son's development as not only a hockey player, but also an overall athlete. He knows that the skills our son has learned both on and off-ice are ones that will stay with him for the rest of his life. But parents mourn the end of their children's sports careers differently and I'm only beginning to understand this phenomenon. As I sit here at the rink where I've dropped off my son so many times before or watched his games, I'm nostalgic about the end of a very special time in our lives. I can't even begin to appreciate what other parents, hockey parents, must go through realizing their children's "hockey life" -- because it is a life -- will draw to a close. I'm now keenly aware of how differently each parent processes the emotion of watching something come to its natural end. After all, I had no idea that I too would be mourning my son's hockey time in my own way. I've just received a message that my son's team has won the tournament -- their fourth year in a row to take the championship title and I'm overcome with pride as I imagine them holding up the trophy victoriously and losing their voices from cheers of joy. We speak of life "being a journey and not the destination." Here we are nearing the destination. Who knew that the inevitable end of my son's hockey time would make me realize how very great that journey was -- even if I, the "Peripheral Hockey Mom," was only on the ride part of the time.